Do you have the Medicine Hands textbook? See your enrollment options above for "I already own the text". 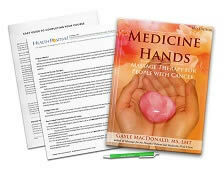 Based on a textbook by Gayle MacDonald, MS, LMT, this detailed and informative course presents solid conceptual guidelines about safe, beneficial touch for people who have cancer. It includes the research, science, and cautions of using touch to support people of all ages who have cancer, including ways massage can strengthen the body before and after cancer treatment. The textbook provides a valuable, comprehensive resource that will interest massage therapists, clients and caregivers. This course does not teach hands-on skills. Please seek additional experience, with a mentor, to add hands-on skills. Kim Leher - RN CMT, State of PA.
Identify the current paradigm shift in massaging persons who have cancer. Recognize at least four key factors regarding massage and metastasis. List the four specific variables in research related to massage for people who have cancer. Identify at least three potential benefits of bodywork for cancer patients. Recognize the common short-term and long-term side effects of conventional cancer treatments. List the essential elements involved in gloving. Describe the adjustments necessary to make a bodywork session less demanding for the client. Identify how bodywork can strengthen the vital organs, immune function and psychological response for clients who have cancer. Describe how massage can give comfort in the final stages of life. List at least three of the recommendations for giving bodywork to caregivers in the home.